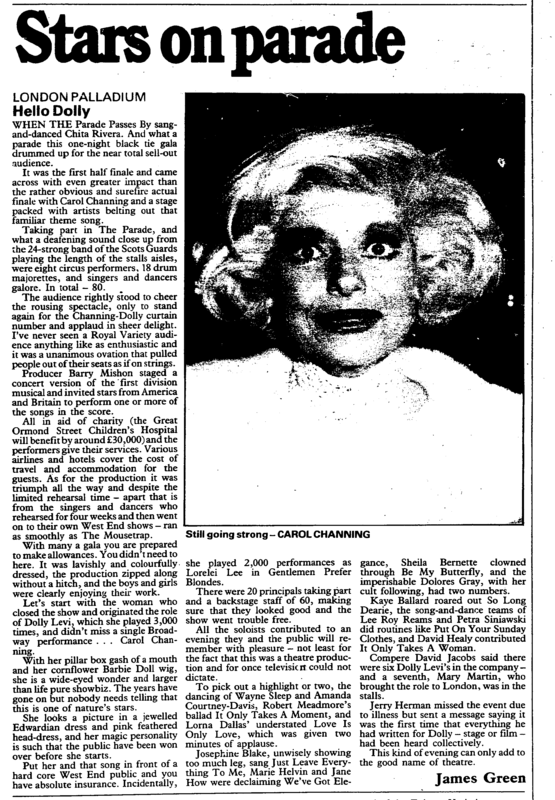 When she made her London stage debut in 1970, Carol Channing came trailing glory as a Tony award-winning Broadway veteran of 20 years and more, an Oscar-nominated, Golden Globe-winning film star and an entertainer of uncommon and distinctive qualities. An extended cabaret act featuring the multi-talented star surrounded by 10 male dancers, Carol Channing and Ten Stout-Hearted Men – described as “a musical frappe” – at the Theatre Royal Drury Lane saw British audiences and critics react to their first encounter with the extraordinary performer with the same unfettered approbation to which their US counterparts had become accustomed. The Stage greeted her as “a brilliant comedienne, witty, subtle, penetrating… a performer of rare gifts,” her success prompting an editorial from the paper’s then editor Eric Johns who declared her “a star for all time”. Born in Seattle and raised in San Francisco as the daughter of an African-American journalist father and a mother of German-Jewish heritage, Channing had been performing since the age of seven. She had already appeared on Broadway three times (making her debut understudying Eve Arden in Cole Porter’s Let’s Face It! in 1941) when she first caught attention in the 1948 musical revue Lend an Ear. She capitalised on her new-found approval the following year as the seductive, gold-digging Lorelei in the musical version of Anita Loos’ Gentlemen Prefer Blondes – a role revisited in 1974 as the titular Lorelei. Replacing Rosalind Russell in Leonard Bernstein’s Wonderful Town on Broadway in 1953 added further lustre to a career that had by then begun to establish itself on American television, where she was to remain a fixture throughout the next four decades and more. But it was the match-making socialite Dolly Levi in Hello, Dolly! who secured Channing’s place in theatrical history. Having created the Tony award-winning role for its 1964 debut on Broadway – appearing in all 2,844 performances – she returned to it throughout her career, reprising it twice on Broadway, the second time in 1995 at the age of 74. Channing’s striking looks and ditzy persona belied a fiercely disciplined professionalism and arguably contributed to her surrendering her two signature roles more than once – Lorelei to Marilyn Monroe in the 1953 film version of Gentlemen Prefer Blondes and Dolly, separately, to Mary Martin in the London stage premiere in 1965, and to Barbra Streisand in the 1969 film adaptation. When she made her belated London debut in the role at the Theatre Royal Drury Lane in 1979, it secured her a Society of West End Theatre (now Olivier) award nomination. Effervescent and electric on stage with “a personality of uncommon character and fascination,” she seldom ventured into straight plays. Rare exceptions were George Bernard Shaw’s Pygmalion (1953) and The Millionairess (1963), and Abe Burrows’ short-lived Four on a Garden in 1970. 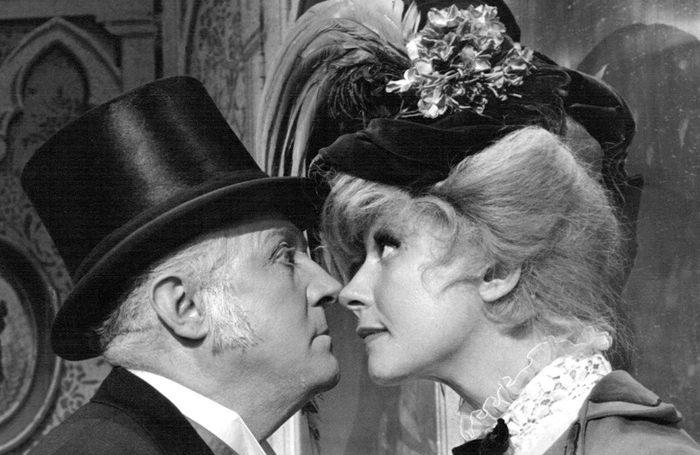 Woefully mis-cast as Alma in Ben Travers’ The Bed Before Yesterday, a planned Broadway run in 1976 was scuppered when the production closed while still touring. On film, she gained an Oscar nomination as the eccentric Muzzy van Hossmere – a role that seemed tailor-made for her effervescent and electric persona – in 1967’s Thoroughly Modern Millie. She received a Tony award for lifetime achievement in 1995 and published a memoir, Just Lucky I Guess, in 2002. 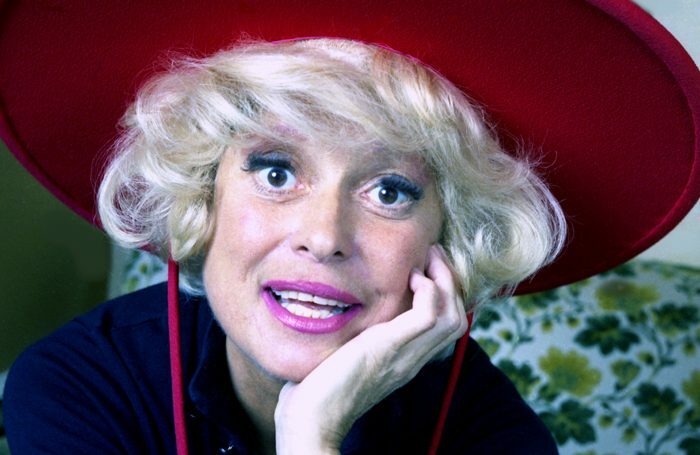 Carol Elaine Channing was born on January 31, 1921 and died on January 15, aged 97. Married four times, she is survived by her son, the cartoonist Chan Lowe, from her second marriage.